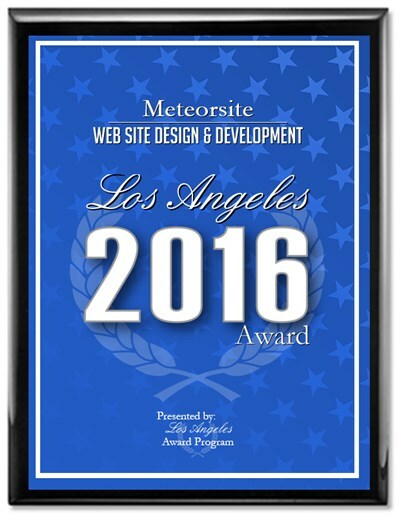 LOS ANGELES October 21, 2016 -- Meteorsite has been selected for the 2016 Los Angeles Award in the Web Site Design & Development category by the Los Angeles Award Program. We at Meteorsite were extremely happy to have been awarded the 2016 Best Los Angeles Web Design & Development Company award this year. After 20 years in the business and 15 years as Meteorsite, we've seen the design, development, optimization and launch of many, many sites for many local, national and international clients and it's wonderful to be recognized officially and publically with this fantastic award. We've had the honor and pleasure of working with a fabulous and talented crew of very brainy, artsy and dedicated people; have had the excitement of seeing ideas go from imagination to internet and have seen the success of many a site and campaign. They say it's not work if you love what you're doing so it seems that none of us have jobs; we have fun in a rewarding atmosphere of creativity. Ours is an adventure that always enriches us with new knowledge and experience; ever learning - ever growing. Los Angeles is our home town and we love working with our local clients and it is amazing to see how a solid and beautiful web presence can take their ideas across the globe. We've had clients reach out across the continent and the world to new clients that can't simply walk-in to their business. We've helped to take creative enterprises online and have seen the sharing of ideas and content and in-depth works via Search and via Social. We've seen, in the last 18 years, the web and Search grow by leaps and bounds and we're proud to have been a part of it. We look forward to continuing to learn, to grow and to share our knowledge and abilities with new and diverse clients, here in L.A., the US and abroad. A special thanks to you, our staff; to you our clients and to the Los Angeles Award team for this wonderful prize and the vote of recognition it inherantly comes with.